Impending death rarely looks this good. Mireille Bouquet leads the life of a normal, successful Frenchwoman, besides the fact that she is a professional hitwoman. That all changes when she follows up on an e-mail she received and goes to Japan. There she meets Yumura Kirika, a girl with skills that exceed those of Mireille’s and no memory of her own past. Kirika invites Mireille to take a “pilgrimage to the past.” Soon, both Mireille and Kirika stumble upon a secret society that may have the answers to all their questions….if they live long enough to arrive at those answers. I feel the best way to describe Noir is to identify it as the anti-Cowboy Bebop. Bebop, most of the time, was a pretty quintessentially feel-good anime whereas Noir, most of the time, was depressing. Also many themes of Noir represent the antitheses of those in Bebop; the leads of Noir seek to rediscover their pasts whereas Spike in Bebop wanted to run away from his more than anything else. Admittedly, Noir was a series that you need to allow to grow on you. The series’ key weakness is also one of the first things to show itself off: the poor pacing. Many of the earlier episodes honestly felt like filler as their plots were more or less episodic and they did nothing to develop the story or characters. Things definitely improved later on, especially by the halfway point. 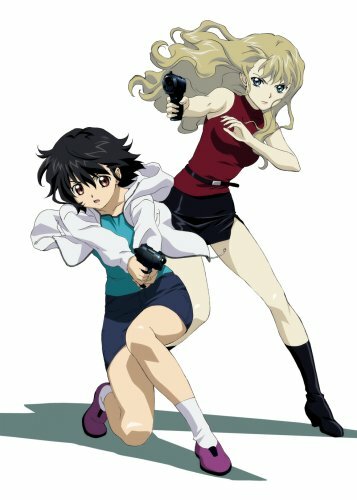 While the main plot with Les Soldats in itself was full of intrigue, what I enjoyed seeing most was the development of the relationship between Mireille and Kirika. One of the first thing Mireille promises is to kill Kirika after they discover their pasts; that promise was for security reasons so Mireille could continue her life as an assassin. And when Kirika does come to live in Paris with Mireille, one can see that Mireille sees the emotionless Kirika as an annoyance more than anything. An annoyance necessary to achieve her own goals, but an annoyance nonetheless. A good example of this is when Kirika got herself wounded after offing a Middle Eastern ruler, and Mireille was forced to drag the both of them to safety. As the series progresses however, how the both of them see one another does change. While development was light in the earlier episodes, it definitely picked up and made up for lost time. As one can expect from an anime called Noir, many elements of the film noir genre are represented. Most important is the general sense of moral ambiguity. While I could see how everything everyone set out to do made sense, most were carried out in ways that I found questionable. What was not ambiguous, however, was the quality of the presentation. Noir had some pretty high quality animation, and I did appreciate that the animators took it easy on the computer graphics. Mireille and Kirika had two of the most attractive character designs I have seen this side of Fujishima Kousuke (of You’re Under Arrest! and Oh! My Goddess! fame). Also I did appreciate the detail that the animators put into the firearms that the two leads use, and this can be seen particularly when said weapons are disassembled for maintenance. Of course, plenty of sweet action sequences are to be had in Noir. Admittedly, while the visuals overall are nothing to make Cowboy Bebop (a series that came out 3 years prior to Noir) jealous, this was still a really pretty series. What I really noticed first upon starting the series, even before the animation, was the sweetness of the soundtrack. Studio Bee Train could not have picked a more appropriate song than Coppelia’s Casket for the opening theme. Much of the background music is made of choral and stringed instrumentals, both of which were augmented with a dash of jazz. What really has a special place in my heart, however, is the ending theme. Arai Akino is one of my all time favorite singers, and her Kirei na Kanjou is one my favorite songs. Such a beautiful song is the perfect one to pick up a viewer after they were (quite likely) somewhat depressed by the events that had just transpired in the episode. Overall the voice acting was good. Mitsuishi Kotono gave a believable performance as Mireille, a young yet very mature woman. I think this was funny considering she gave equally believable performances as the young and not so mature Sailor Moon in her series and the equally immature Katsuragi Misato in Neon Genesis Evangelion. Kuwashima Hoko, as intended initially, made Kirika seem completely devoid of emotion and thus gave a pretty flat performance. It was not until Kirika’s character underwent a change that Kuwashima was allowed to really exercise her ability as a voice actress, which she delivered in full. The voice acting can represent Noir overall. While a little rough around the edges, it is still a solid series that should definitely be picked up if you like series such as Cowboy Bebop; it works as a very nice complement in the ways it was opposite to Bebop. The main thing is that you have to be able to make it past the less-than-stellar early episodes which, while featuring sweet action sequences, did nothing to really make the story interesting. NOTE: I saw one episode of the show dubbed into English, and I would say the dub is definitely something to steer clear of. The episode I saw took place in the Middle East, and the English voice actors insisted upon giving the Middle Eastern characters accents. Apparently, someone also had the (thankfully rejected) idea of giving Mireille a Corsican accent. Also, I think a good indicator of something being wrong with an English dub is when the pronunciation of French words (i.e. soldats) is actually more correct in the Japanese version.